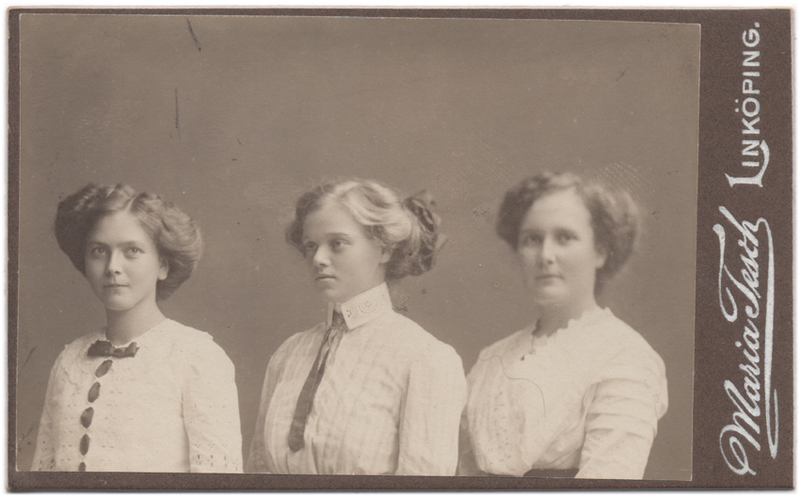 A photograph of three unidentified young women posing together, side by side. The picture is otherwise clear and sharp, but the face of the woman standing on the right side is blurred out of focus. I believe poor or careless photography technique is to blame for this – there are also a couple of fingerprints smudged on the image – but the effect also feeds my wild imagination, causing my brain to come up with stories that most likely have nothing to do with the truth. The photograph has been taken in Linköping, Sweden, by photographer Maria Tesch, at some point during the early 20th century; my guess is during the 1920’s.